Time passes, it seems, increasingly quickly and it’s now more than a month since the international Linear Collider Workshop, LCWS2015, took place in Whistler, British Columbia. This marked the latest milestone in our global community’s preparations for a next-generation high-energy linear electron-positron collider to explore (to paraphrase Donald Rumsfeld) the ‘known knowns’, namely the physics of the Higgs boson and the top quark, as well as to prepare for the ‘known unknowns’, i.e. the beyond-Standard Model physics that must be there, perhaps manifesting Nature’s implementation of Supersymmetry or some other clever human idea, and also to be prepared for the ‘unknown unknowns’, i.e. something totally weird and unexpected, which would potentially cause a paradigm shift in our understanding of subatomic matter and the forces of Nature. In a similar vein another significant milestone was reached at CERN in the past month with the completion of the 2015 proton-proton run at the Large Hadron Collider – the heavy-ion run is still in full swing as I write – at the new maximum collision energy of 13 TeV. I am privileged to serve on CERN’s Large Hadron Collider Committee (‘LHCC’) and to have the opportunity to help monitor and guide the LHC’s experimental programme. After the two-year shutdown for consolidation of the LHC accelerator complex and increase of the beam energy by almost a factor of two, 2015 was always going to be a tough year, requiring careful and dedicated re-starting and re-commissioning of the upgraded machine. Nevertheless, at the end of the proton-proton run period 3-4 fb-1 of luminosity has been recorded by ATLAS and CMS. Combined with the beam energy increase this represents a data sample that provides a significant advance in statistical power, and mass reach, for direct new-particle searches. This will already take us well beyond the results obtained with the Run-1 data sample that was collected between 2009 and 2012. 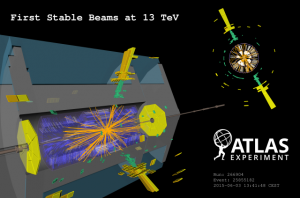 A special seminar is scheduled at CERN for 15 December at which first results from the complete 2015 LHC data sample will be presented by the experimental collaborations. Moreover, once the LHC gets back into its stride after the Year End Technical Stop (or winter shutdown), and with further hard work by the machine group to increase the luminosity, we can look forward to significantly more data in 2016 and beyond. So by any measure the next few years will be exciting for the global particle physics community, and especially so for the linear collider community, as the LHC results will help point us towards the optimal future pathway. The ILC already has a guaranteed, gold-plated physics capability whose crown jewels are precision measurements of the Higgs boson and the top-quark, not to mention a wealth of other precision measurements and searches, to be realised in a multi-decade programme that would cover energies up to around 1 TeV. CLIC is targeting the highest energies, up to around 3 TeV, that we can currently imagine realising with an electron-positron collider based on state-of-the-art accelerating technology. If new heavy particles at the TeV mass scale are revealed by the LHC over the next few years then CLIC could well be the best way to produce them copiously and study them incisively in a clean experimental environment. The next CLIC project milestone will be the 2016 CLIC workshop, at CERN, 18 to 22 January, where we will review the machine, detector and physics studies status and plans, with a view to the next update of the European particle physics strategy around 2019. Everyone is warmly invited to participate. Finally, in the linear collider community we should keep in mind the well-known motto of the scouts: ‘be prepared!’ … for what the LHC will soon tell us. Philip Burrows is CLIC Accelerator Collaboration spokesman and acting Associate Director for the Compact Linear Collider Study in the Linear Collider Collaboration.